Rain's Embellishments: Meet a Crafter! - Craftoberfest! To gear you up and get you excited about Craftoberfest we will be featuring some of our sellers on the blog in the next coming weeks. We have 27 people selling at this event with a wide range of items that all will enjoy! To get it started I'd like you to meet Cris of Skeletal Drop Kick! Living in the Sacramento area, Cris tends to be a tad overwhelmed by the ordinary at times. By releasing her inner monsters, she is able to produce many cephalopods and critters to make room for new stuff in her head. Her latest materials of choice are yarn and ceramic. All of her clay is fired to the astounding temperature of 2350 degrees F, making them stinking sturdy and fantastically wonderful. 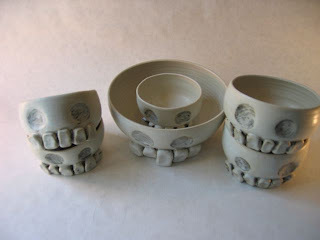 Her glazes are all handmade and her pieces are thrown on the wheel and then altered to appear a bit more like they do in her head. 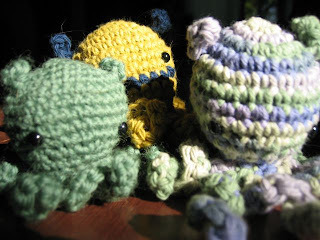 Her crochet cephalopods are done when she cannot get her hands on some clay. They are all her own original design and actually, she doesn't work from a pattern which explains why they don't all look exactly alike. For more information, please visit her Etsy store!